You have more options than ever before after graduation. Whether you plan to enter the workforce, join the military, pursue an apprenticeship or college, Core Plus Aerospace can help. Core Plus Aerospace will give you opportunities to take hands-on classes and explore careers while still in high school. Depending on your district, you can earn math, science, English, Career and Technical Education (CTE), and elective credits. The real skills you learn will give you a clear advantage when applying for a job in manufacturing, pursuing an apprenticeship, or preparing for college programs in fields such as applied sciences and engineering. Core Plus Aerospace students and graduates share their stories of what a class is like and how the Core Plus Aerospace curriculum prepares them for the future. 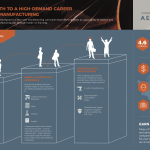 These fact sheets will help you explore where Core Plus Aerospace can take you. Learn how Core Plus Aerospace gives students more options after high school. See how you can plan your path with Core Plus Aerospace.